Hit the surf like never before with the Peter Lynn Swell, a 3-strut SLE that brings wakestyle, freeride, wave & surf closer together than ever. The Swell is designed to give you the responsiveness and manoeuvrability of a wave/wake style kite and combines it with smooth drift and great stability that allows you to focus on surfing. Add to this a gigantic windrange and you end up with a versatile kite that performs in a variety of conditions. Have been riding the 7m and 10.5m Swells for a while now. Really love them for all round riding and waves. This kite does exactly what it sets out to do. Its an easy set up, no nonsense wave kite that everyone can use and dial into immediately. The beauty of it is that it has good wave riding characteristics - drifts well, steers on slack lines but doesn't sacrifice the freeride characteristics an every day rider wants. Its easy to jump with and the 10.5 is as floaty as you need to be! The bar could do with a little refinement - the safety reset is a bit difficult to dobunderwater, one-handed - but this will no doubt be improved in in the future. The bar is solid and the whole overall build is simple and dependable. The pulley-less bridles are short and uncomplicated. Overall a great kite and everyone just have a go on one. I've heard from the manufacturer that the 2014 Swell was tweaked during the last month. So I take the 10.5m for a new ride. And yes, they tweaked the Swell characteristics. Less explosive power, great feedback and more stability. Great for an all-round ride! But it's also a wave kite and the most important characteristic for a wave kite is downwind drift. This can be tweaked a bit more. It floats with you, but I like more bar feedback going down the line. So, yes the Swell is tuned in its all-round feel, as a wave kite it can be tweaked a bit more. The last 6 weeks we’ve been using the Swell across the southern coastline of Australia (From Tasmania to Western Australia. We used the 7, 9 and 12m kites in various conditions, from the gusty unpredictable winds in Tassie, to the warm thermal winds up Western Australia. Just for the record, we’re not affiliated to any kite brand, let alone the kite subject to this review. By no means we are professional riders, both of us just like to be out there in the water and having fun. Hope you find this review useful. The Swell is a very well build three strut kite with reinforcements on the right places, without overdoing it. Everything is super stitched then reinforced with heavy duty materials where needed. As lazy as I am, its good to see the kite has the one pump system. Design is a personal thing, to me it was much to my liking. The kite has no moving objects (like pullies) that can break down by heavy usage in combination with sand, instead they used a smart metal ring for smooth movement of the lines (I believe they call it sheaveless pulleys.). In other words, it’s a high quality build kite that can take a few roll in the waves or a punch on the beach. The new 4-line bar is neat and has an improved safety system (Centrix push-away quick release chicken loop). In case you need to use your safety, you will need to push the safety-switch away from the body, whereas with their older bar you had to pull the safety-switch towards yourself. For me, both systems would work just fine, but its good to see that safety systems in the industry become more standardised. Depower is easy to reach and everything appears well made and robust, like you would expect from a 2014 kite. First thing you notice when you fly this kite the first time, is how easy it is to fly. From the first moment you start the kite, it feels comfortable, responsive and its very stable. The both of us have used quite a few kites in our lives and the Swell felt straight away very comfi and safe. Or, to use the words of my mate after his first run; “..kiting just became fun again, its so natural..” (it always has been, but its great to see that a new kite gives you a new perspective). Relauching the kite is easy as Sundays, as is the bar pressure (light to moderate) and upwind performance is impressive. We started using the kite in Tasmania and never ever experienced these strange type of wind-conditions. Winds went from 8kn to 40kn and back within a minute and changed 180 degrees while kiting. One of the big advantages of this kite is the exceptionally windrange. As you may expect from a wave-kite is the huge depower and I believe this is one of the best features of the kite. It really has an ON-OFF switch. The moment you depower the kite, the power is gone. With some kites you can loose control while going a bit too much down wind, but this kite nicely drifts with you and comes back to life the moment you need it. Looping the kite and drifting down the line felt very easy. Even with the bigger 12m, the turning ratio was much better than expected. But most fun was when we could take the 7 out of the bag. We all know that the smaller kites just add more excitement and with the Swell this is no exception. To me the 7m was the dream machine of the three kites we used, its fast, responsive and very easy to handle in the waves. Unsurprisingly the Swell produces excellent output when you’re surfing down the line. To our surprise the kite performed better then expected with a twintip on our feet. Using a size bigger with a twintip, it was more then perfect for the occasional wake- or freestyle tricks, with plenty of hangtime. -	ON-OFF switch or the ability to totally depower the kite without loosing control. -	Kite steady drift along the line getting back to life when needed. -	all round performance; better then expected kite for some free style kiting, without loosing the performance you need for wave-riding. Looking at the cons you might guess from reading the above, this will be a fairly short paragraph. The first thing that springs to mind was that we were a bit confused by the use of the coloured lines and different colour sleeved attaching points on the kite. Its a no brainer for the more experienced kiter, but a beginner could be a bit confused. Not really a con, but on the water, you needed to go downwind a bit more then usual when you start, before turning up wind. The performance really improved once you had a bit of speed, but the first meters you loose a bit. Once you surf, this is not an issue. But really, these few niggles are really the only things we could pick out as criticism. Personally, I do nothing but wave-riding and like to cruise along the lines. This review is based on my own experiences and that of my mates. Both of us do nothing too extreme but we’re out there as much as we can, enjoying the waves. When we used the Swell we said it was possibly one the most compelling, capable and well-rounded wave kite we have been using in the last years. It has been such a joy to use, adding even more adventure to our trip. I have no doubt recommending this kite to anybody. There are many nice three strut wave kites on the marked and in my opinion the Swell should be on your shortlist when you are considering a new one. Cheers and enjoy the ride! I tested the Swell 5 and 7 m2 in Holland, during wintertime, over the last couple of weeks. 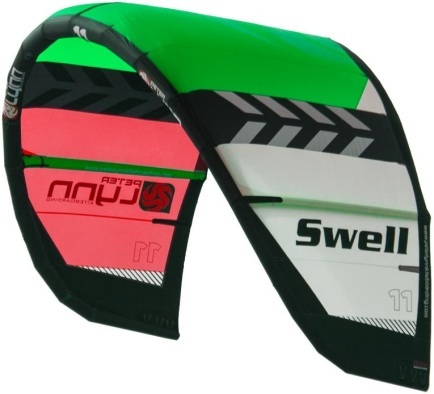 First of all: The Swell is the absolute perfect all-round wave kite. Great drift abilities, very stable and variable winds, extreme low-end (I prefer to surf rather than to sail) and wave riding in high winds is still very possible. The high end of the Swell is sublime. It is a total control kite. During the stormy conditions in December 2013, the kites made wave riding still so much fun! When the wind drops, don't panic, the Swell also can be surfed about 1 m2 smaller then all the others on the water, so you'll be the last man standing. Some wave kites are real killer machines, with a very small twist of your wrist you'll find the kite waiting for you in the water if you pay no attention. The Swell's reaction is quick, but not too quick, which makes wave sailing in the Dutch conditions a lot easier. I have tested the 5m, 6m, 7m, and 9m swell in all types of conditions in South Africa. mostly in waves. I found it super stable reactive and with great bar response. To me it feels like a medium aspect ratio kite that has been given a wave/ low aspect ratio characteristics to make it a really outstanding kite for waves. However it turns out that it performs well in other things like looping and freestyle. But outstanding drift in waves makes it my number one choice. The 5m has a huge top end. It was used a few times in Cape Town howling South Easter. The 6m van handle a lot of wind and the 9m is still responsive to be fun in waves. I am busy messing around with line length to see how the kite reacts. All of them have great grunt in the bottom end, and easy relaunch makes it a good choice for beginners too. I tested the Peter Lynn Swell 9m in gusty side onshore winds. 23m lines and standard (middle) set-up. Peter Lynn placed the Swell as an all-round wave kite. Personally It's a shame when a manufacturer chooses such a wide public. Mixed characteristics made the Swell very all round and lost a few key point to serve the wave rider, regardless of your wave style. Like to ride downwind with the kite parked or fancy the fast manoeuvring kite to slingshot yourself in the wave. For the first style of riding (parked) I think the Swell needs more drift and control with low line tension. For the fast kite style the Swell 9m is is just not fast enough. (7m would be better). The Swell has a wide wind window, go too much down wind and you ride your kite out of the wind window. The good thing about this wide wind window is that the Swell has a great upwind ability, with one tack you are ready for the next set! For strapless riders the boost of the Swell is pretty explosive, again great all-round ability to keep the kite lively but not a great characteristic for a wave kite. Resume: It's the combination of different characteristics that divine a kite. I like to see the new 9m Swell more as an all round kite than a wave oriented kite! Didn't test it with a twin tip but I think the kite will be more in it's element! I am curious about the smaller sizes.